Philadelphia based distributor Breaking Glass Pictures has announed a new venture in which it will open a United Kingdom distribution label. With a rapid release of three LGBT-themed titles in the 4th quarter, Breaking Glass UK will release one title per month of varying genres as it continues to grow internationally. Stemming from their fully developed International Sales Division, Breaking Glass Pictures' venture into the United Kingdom will be their first expansion into International Distribution. Named after David Bowie's 1995 hit Breaking Glass, CEO Rich Wolff and Co-President Richard Ross began Breaking Glass Pictures with expansion in mind. "It's what we've always been aiming for. We want to bring our success from the U.S. to the U.K."
"After celebrating our third anniversary in North America, Breaking Glass Pictures is proud to announce our launch in the UK through Lace Digital Media Group. We promise an exciting, diverse mix of product that will include LGBT, horror, documentary and star-driven independent fare," said Ross. Breaking Glass UK will debut with the 8th October release of the gay-thriller Into the Lion's Den, starring gay icons Jesse Archer and Ronnie Kroell. Jesse Archer (Violet Tendencies, Going Down in La-La Land) and Ronnie Kroell (Eating Out: Drama Camp, Bravo's Make Me a Supermodel) headline in this bold, uncompromising thriller that plunges into the depths of human depravity. Releasing on 22nd October, Breaking Glass UK will examine the complex relationship between sexuality and religion in The Seminarian – the story of one closeted seminary student torn between his love of God and the love of his life. Ryan is a closeted student in his final semester of seminary studies. Despite his school's hostile stance towards homosexuality, Ryan has two gay classmates, Gerald and Anthony, in whom he secretly confides. He is also close to his religiously devout mother who, as things stand, is unaware of his sexual orientation. Ryan needs to complete a solid theological thesis in order to continue doctoral work at the university of his dreams. As he works on his thesis The Divine Gift of Love, Ryan begins a relationship with Bradley a guy he has met on the internet who seems perpetually unable to commit himself. Ryan confides in Gerald and Anthony, only to learn about their romantic struggles as well. Consequently, Ryan questions his views on God's gift of love. 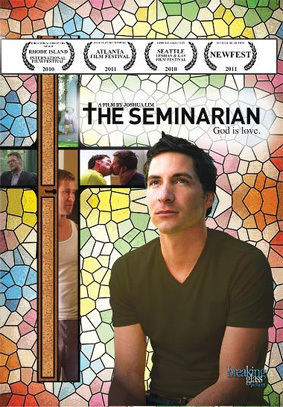 During this volatile time, with the pain of unrequited love and his inability to share his fears with his mother deepening, Ryan struggles with finishing his thesis and holding on to his faith in love. And just in time for the holidays, on 3rd December, Breaking Glass UK will release Walk a Mile in My Pradas. The yuletide is anything but gay when macho construction worker Tony learns his latest project will put him under the supervision of Steve, an openly gay man. After the tension builds between the two co-workers, they finally confront each other at a holiday party and unwittingly cast a Christmas spell that switches their sexual orientations. Now, Tony must scramble to straighten out in time for his wedding but not before he walks a mile in Steve's shoes. 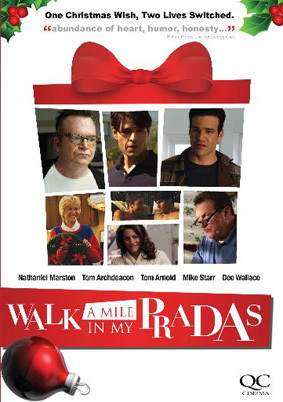 With an ensemble cast featuring Tom Arnold (True Lies, Roseanne), Dee Wallace (E.T., The Frighteners), Mike Starr (Dumb & Dumber), Nathaniel Marston (One Life to Live) and Tom Archdeacon (Days of Our Lives, J. Edgar), Walk a Mile in My Pradas is a heartwarming Christmas comedy that puts a new spin on the classic role reversal storyline. All three discs will retail at £15.99 apiece.